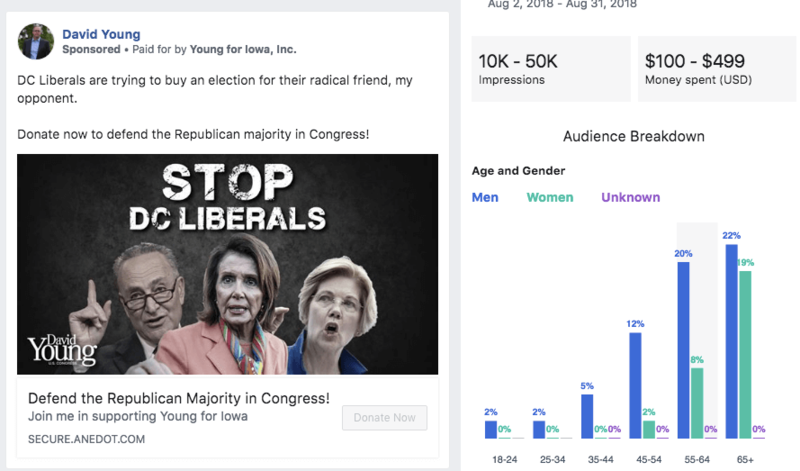 Earlier this year, Facebook began making public every political ad that is run on their platform as part of their effort to create a more transparent process following criticism of Russian influence in the 2016 election. You can now easily find every ad deemed “political” in their Ad Archive, including those currently running, by searching for any candidate’s name. Starting Line pored over every ad run by or about Iowa’s statewide, congressional and state legislative candidates. One consistent theme stuck out: Republicans are running far more creative and comprehensive ad campaigns designed at both persuasion and rallying their base; Democrats are mostly just tossing their TV ads online and running small-dollar fundraising efforts. 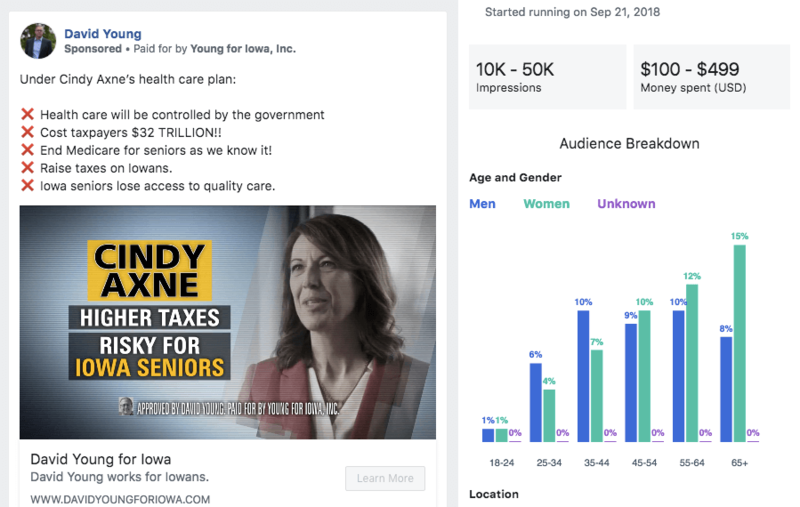 And in two baffling cases, the DCCC is running ads in support of Cindy Axne in the 3rd District where they hit Republican David Young on Social Security, Medicare and the “Age Tax,” using quotes from the AARP. The problem? 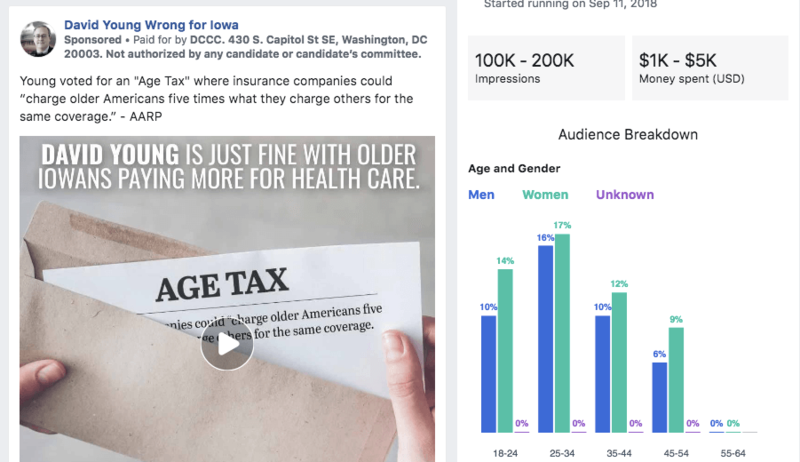 Two of the ads are targeted specifically to voters under the age of 55. The difference in approaches are concerning for several reasons. For one, the Democratic Party is a broad coalition of voter groups, each with their own specific reasons to vote. There seems to be no specialized, targeted messages designed at boosting turnout among Democratic-leaning voters who often don’t vote in midterms. That belies a larger issue here, which is that most Democrats simply don’t seem to have a separate strategy for online advertising. Starting Line hears that a few campaigns have an expanded social media ad plan for the final weeks, but what’s happened so far doesn’t inspire a lot of confidence. It’s also a contrast to the pretty decent social media operations campaigns and the state party are running. When it comes to paid social media work, things are lacking. Advertising on social media and other online outlets has become a crucial part of any campaign, in no small part due to “cord-cutting” voters who no longer watch broadcast television or cable, where most campaign advertising dollars are spent. Many young voters in particular, a critical base vote for Democrats, simply don’t see many TV ads anymore. But Facebook is also skewing older in its users, with many older Americans now getting some of their news from their Facebook feed. And Facebook’s targeting tools are incredibly powerful. Donald Trump’s 2020 campaign manager credits their advertising on Facebook as the key to their 2016 win. Facebook is not the only medium; campaigns also tend to place ads on YouTube, Pandora, Spotify and several other sites. 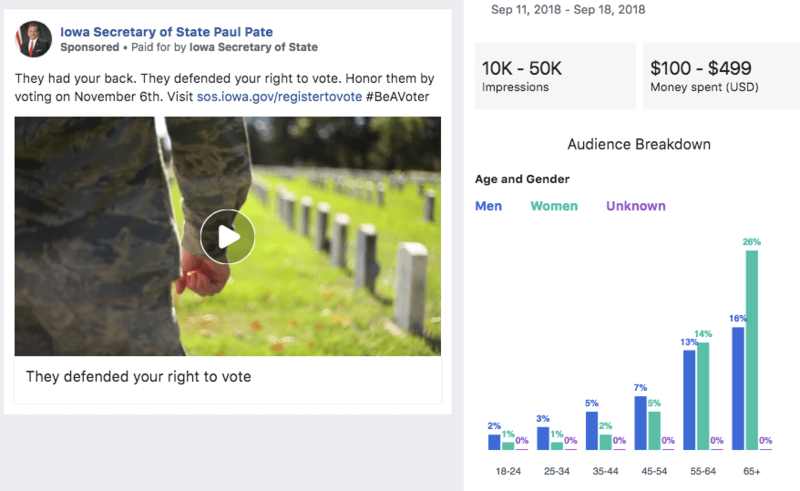 But one can reasonably posit that if their Facebook advertising, where voter targeting and ad creative is the most versatile, is uninspired, than so is their ads elsewhere online. That’s what we’ll take an in-depth look at in this post. This will be a rather long piece, so in case you don’t get to the end, I’ll make one important point right now: if Democratic campaigns don’t significantly expand their digital ad strategy in the final weeks, allied and progressive groups should use this as a wake-up call that they need to fill in the gaps. LGBTQ groups should consider running ads aimed at their community in support of Fred Hubbell, Latino organizations should create some Spanish-language pieces and youth vote groups should plan ads that go beyond the college campus crowd. The good news about Fred Hubbell’s online efforts is that they appear to be putting real money into their Facebook ads. That’s not nothing given many campaigns’ advisers and consultants’ reluctance to spend much money advertising online. 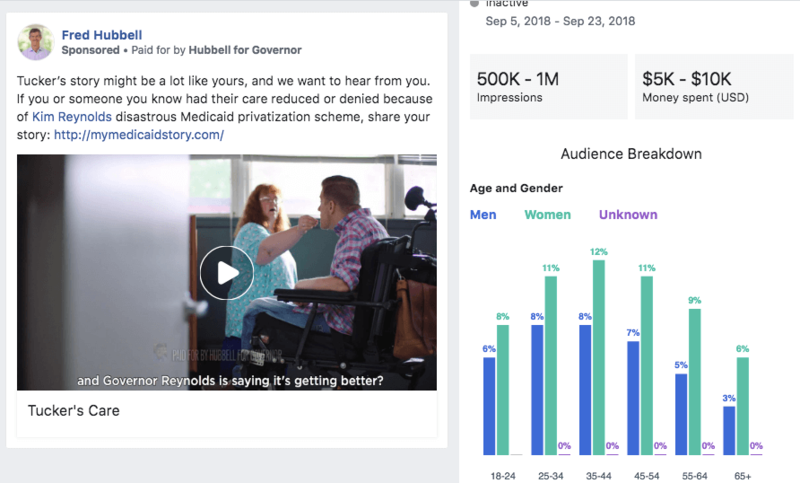 Here’s a recent one where Hubbell is running his latest TV ad about Tucker, a paraplegic man hurt by privatized Medicaid, that has gotten between 500,000 and a million impressions. The stats that Facebook’s Ad Archives give are a little vague but still helpful. 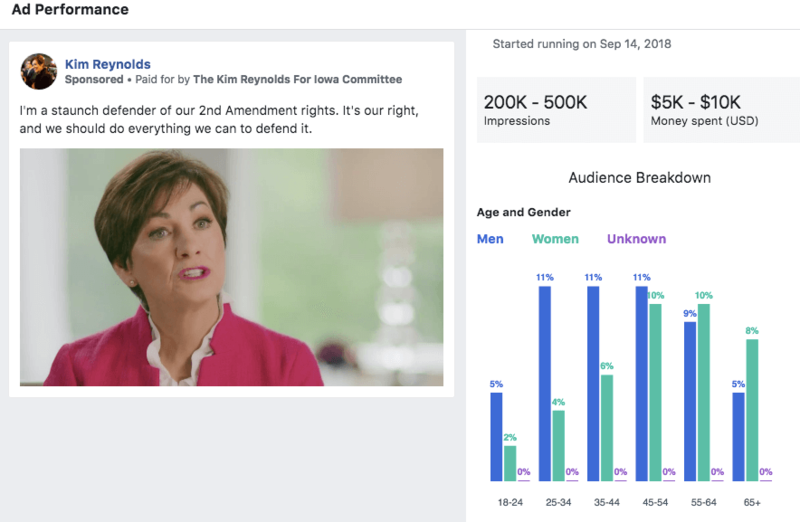 They give a range of money spent, impressions earned, age and gender targeting, as well as which states they were targeted to (I’m only including that when relevant; most are to Iowa only). This first one gives you a sense of just how cost effective Facebook ads are. 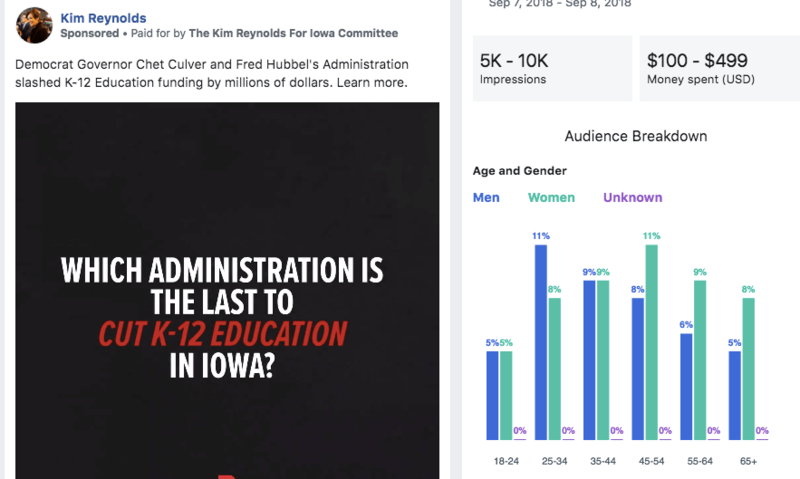 For less than $10,000, Hubbell got his ad seen between 500,000 to a million times (Iowa’s total turnout in 2014 was 1.1 million voters). Meanwhile, Hubbell spent $42,000 on TV ads on KCCI in one week alone earlier this month. Most of Hubbell’s targeting is pretty broad-based, with what looks like a slightly heavier emphasis on women and younger people. He’s run some about Planned Parenthood, which could be used to specifically motivate younger female voters to turn out, though the ad is just simply the TV spot he’s been running regardless. And that’s the problem with Hubbell’s online ads. 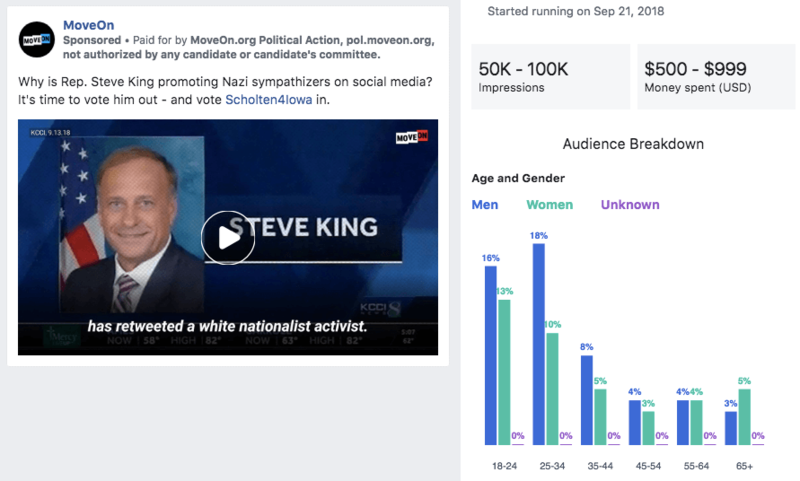 All they’re doing is simply tossing up their TV ads instead of creating content specifically for Facebook’s platform that might target different subsets of voters. It’s still certainly useful in hitting voters another time with your persuasion pieces, and the Tucker ad is creative in that it solicits Iowans’ Medicaid stories. But this approach is also missing out on big opportunities. 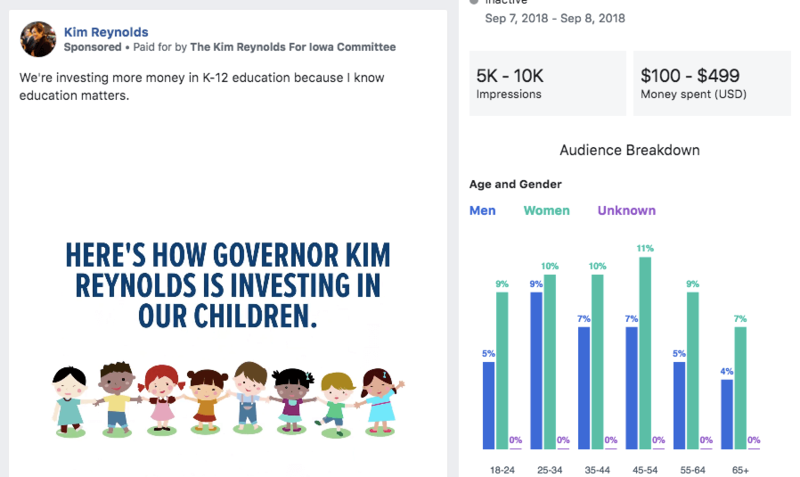 To see what a more targeted approach could look like, let’s turn to Kim Reynolds’ campaign. She too is running some of her TV ads online, but each one appears to have a much different targeted audience. 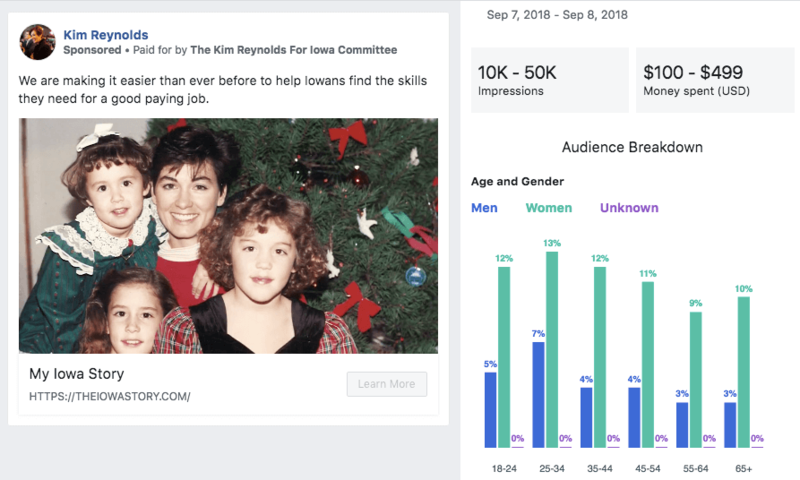 Several Facebook ads that focus more on Reynolds’ personal story, like this one about her graduation from ISU late in life, are being seen by far more women than men. She also is running many of her negative TV hits against Hubbell. 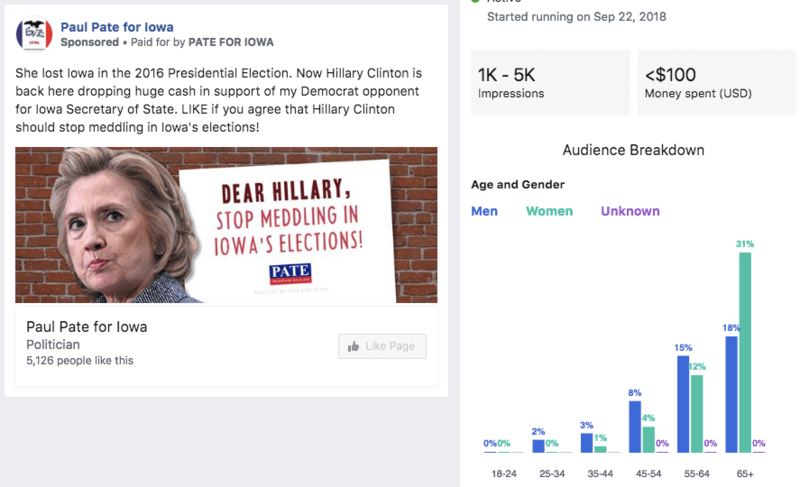 Many of those Facebook ads seem to target older voters more heavily. She also has one about her stance on abortion seemingly aimed at the pro-life crowd. “I’m proud to be part of the most pro-life administration in the history of this state,” she says in it. Both of these ads are smart ways to rally the base about key conservative issues they care about, which is very helpful in a year where many polls show Republicans less enthusiastic about voting than Democrats. Their audiences are also more narrowly targeted at the voters most receptive to it. 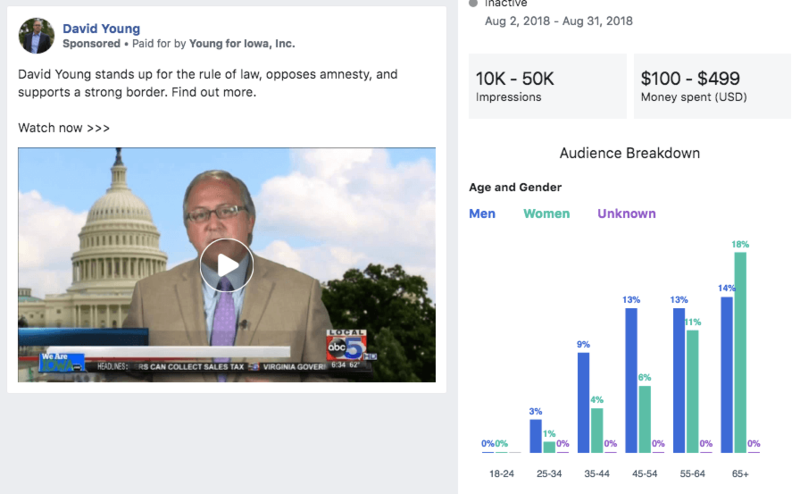 Also, a note on targeting: the 2nd Amendment ad may be aimed at anyone who “likes” the NRA on Facebook, creating those age/gender breakdowns. 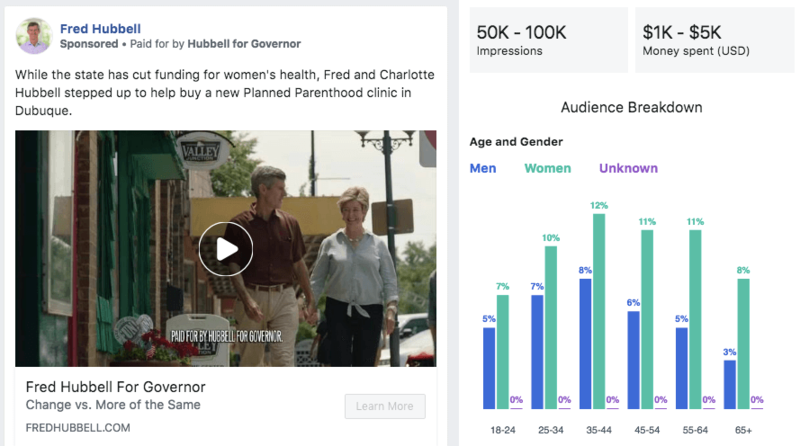 You may also notice that the ads aren’t as heavily slanted to older voters as some of her other ones, ensuring she’s hitting more families with children. 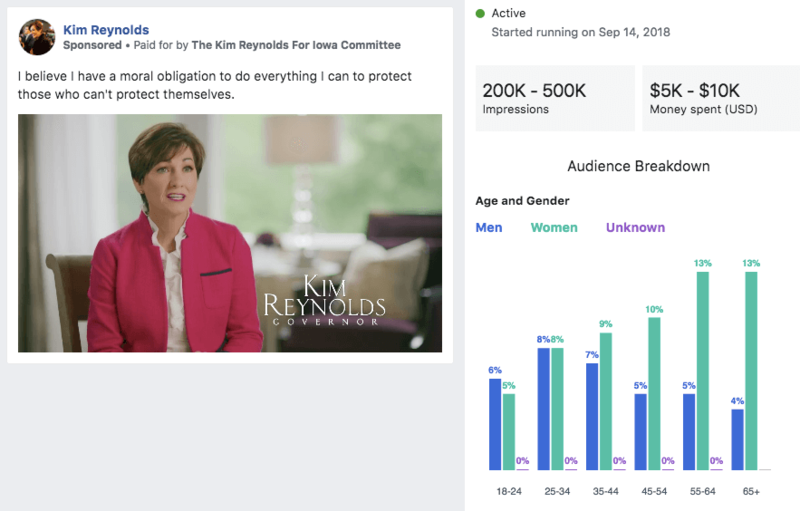 All in all, Kim Reynolds’ campaign is running a smart, targeted and comprehensive digital media strategy that accomplishes both persuasion and turnout goals that their TV, radio and direct mail advertising may not fully cover. As you can also see, these ads and strategies don’t take a ton of effort. It simply requires that campaign leaders have a digital plan in mind while they do all the other usual tasks during the race. 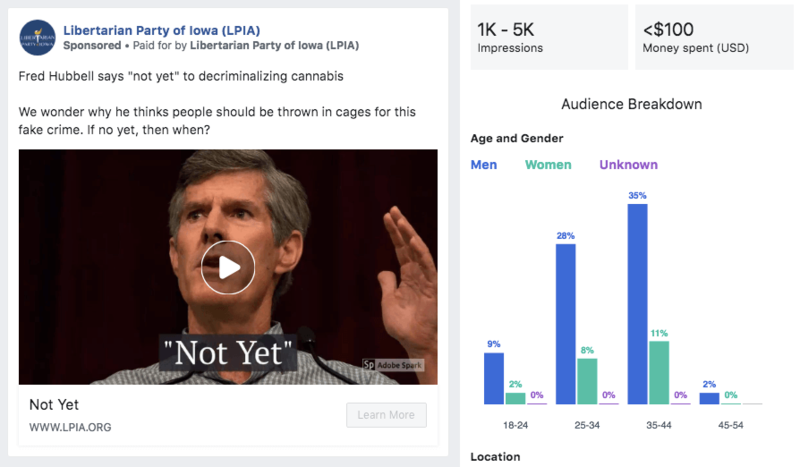 Finally, the Libertarians have an interesting ad up against Hubbell that might be problematic if they had more money behind it. They’re attacking Hubbell on his stance on cannabis with this small buy and a video, targeted almost exclusively to young men. That’s exactly the kind of message that could pull away younger voters who would otherwise vote for Democrats. Fortunately, Jake Porter and the Libertarians haven’t done much with it yet. This is also something that Democrats could insulate themselves against simply by running their own ads about something like tuition or healthcare costs targeted to younger voters who could defect from the party. Let’s move on to the federal races, where Starting Line found the most inexplicable use of online advertising in Iowa, courtesy of the DCCC. 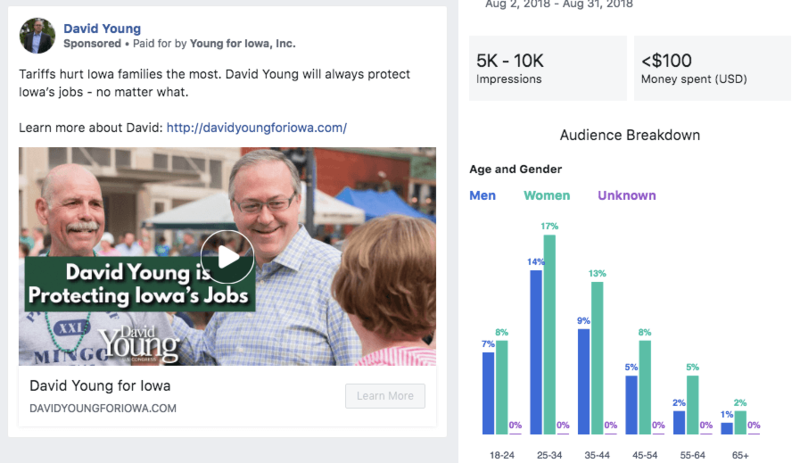 In that race, the national Democratic committee began running a series of Facebook ads three weeks ago to attack Congressman David Young in Iowa’s 3rd District. 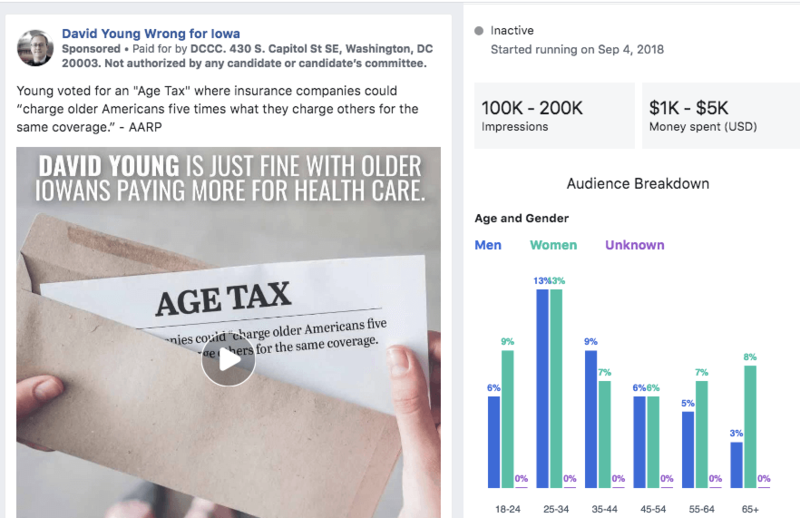 Their first two spots hit David Young over an “Age Tax” and potential cuts to Medicare and Social Security, but two runs of those ads were targeted specifically to voters under 55. In these two instances, the DCCC paid $1,000 to $5,000 to run ads with messaging for older Iowans that completely excluded older Iowans. Now, if you look through the Ad Archive, you’ll see that most campaigns run multiple different versions of the same ad to different audiences. We can only see limited aspects of what those audiences are, but you can tell that they’re trying out different things. Another version of the DCCC’s Age Tax ad went to a broader set of voters, but even here it hit more younger voters than older ones. 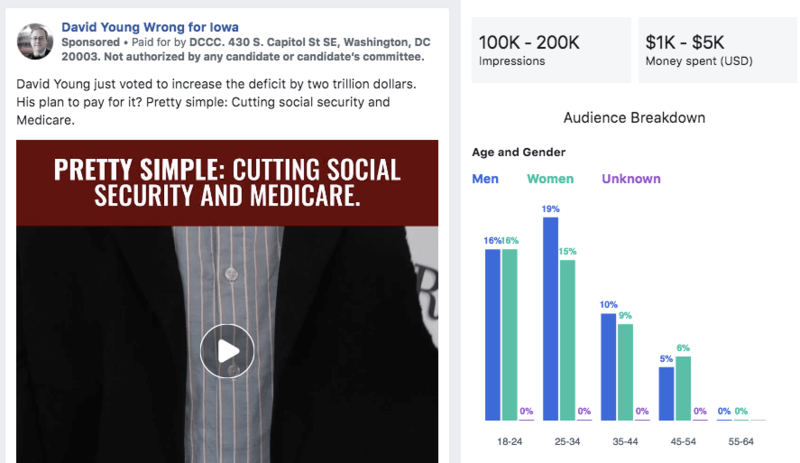 Obviously, running ads on social security and Medicare is important in a state like Iowa with a much older population. And it makes sense to have your TV ads, which hit a very broad range of voters, to be focused on a top-polling issue. But when it comes to Facebook ads, you have incredible, easy-to-use tools to help you target specific messages to the very people who might be most receptive to them. It’s inexcusable to spend thousands of dollars on ads about Social Security that targets only people under 55. Anyway, let’s move on to the candidates’ ads. Two other ads with a few hundred bucks behind them are also very clearly aimed at motivating the base. The targeting for these spots that include Nancy Pelosi are very interesting. Not a single woman under the age of 45 sees them, and overall it’s much more focused on men and older Iowans. These also are asking for money, which is something we’ll see in a number of ads moving forward. Young has a lot of other ads. 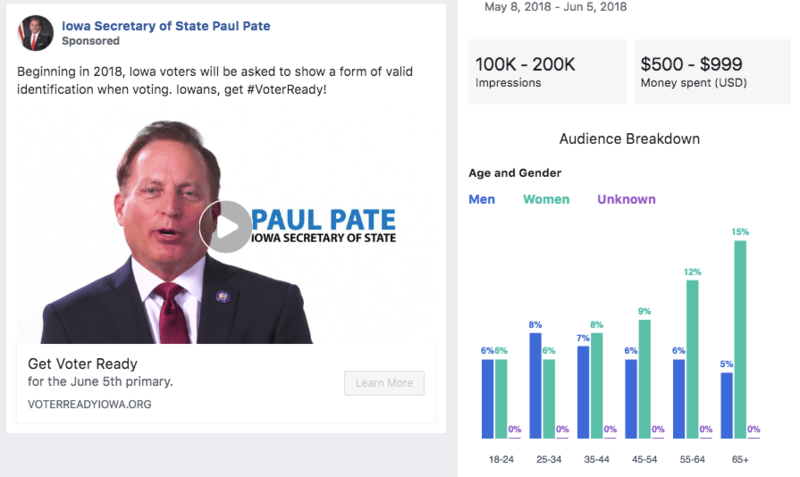 I didn’t count every single one up, but I believe he has the largest number of unique Facebook ads of any Iowa candidate. There aren’t any with as big of ad runs as Hubbell or Reynolds, but he does have a lot of mid-size buys. 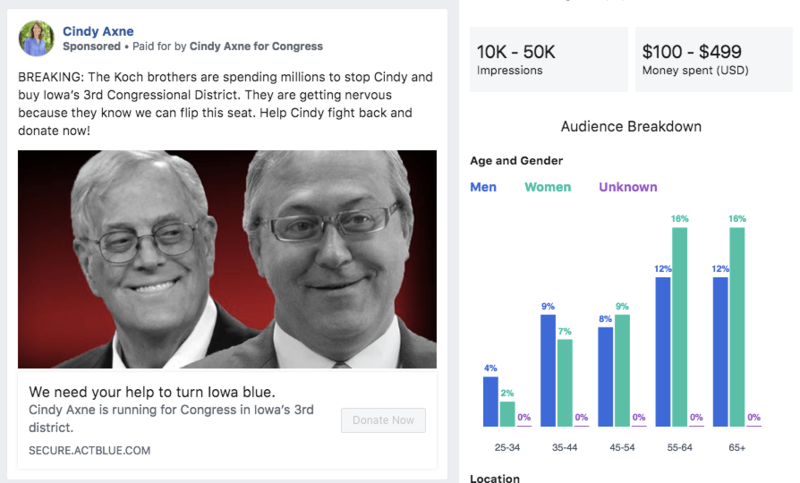 Some of them, like Hubbell and Reynolds, are simply just putting an ad on Facebook that he’s already running on TV, many of which attack Axne. 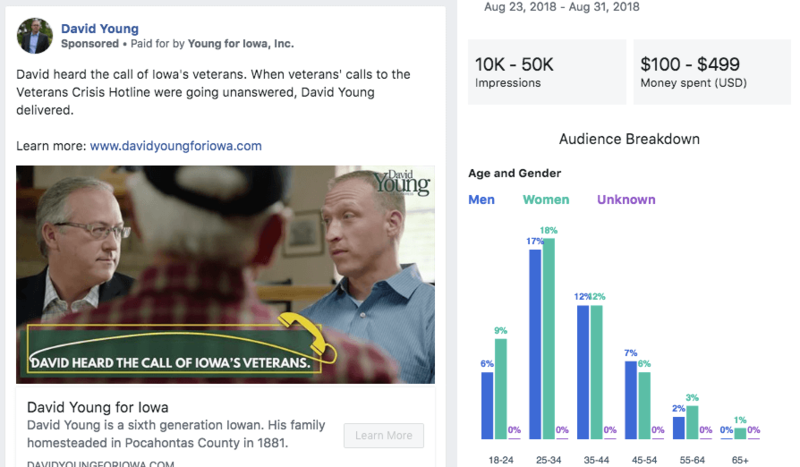 They’re not all perfect, as a couple of Young’s ads that are focused largely at seniors also target a decent number of younger Iowans. The state party is also running some spots on Facebook that knock Axne. Some of those, however, like the one we wrote about yesterday that attacks Axne for lobbying for better puppy mill laws, are so over-the-top that they can backfire. 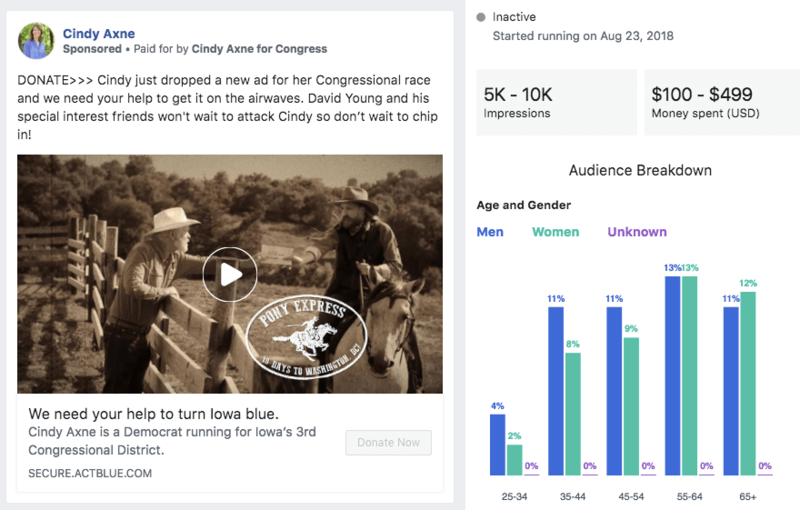 On the other side of things, we’ll see in both Cindy Axne and Abby Finkenauer’s races that Democratic congressional Facebook ads are focused on two things: raising small dollar donations and pushing persuasion messaging. Axne has a couple of smartly-targeted ads in the 3rd District. 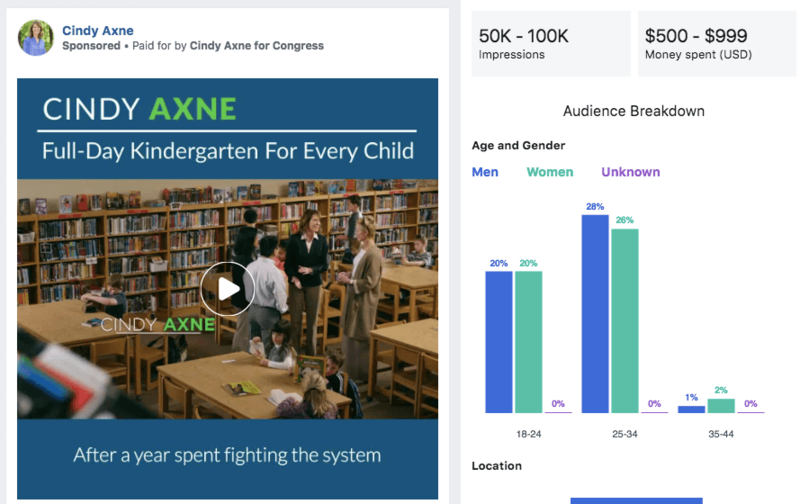 Her TV ad about fighting for full-day kindergarten is running on Facebook in one buy that’s limited to people about 35 and under, which would be the age of most people with kids about to enter kindergarten. She has another, smaller run of this ad targeted to a wider base of voters as well. Axne is also running her TV ads on Facebook as a way to raise more money to keep them airing. 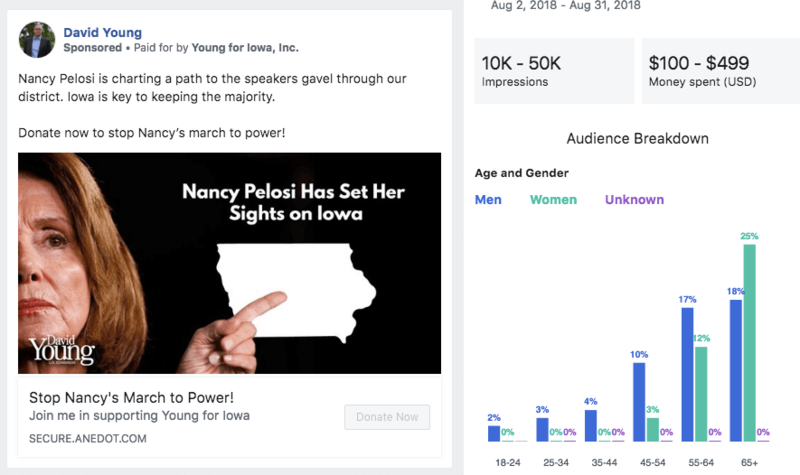 And she has some ads that look specifically targeted at the Democratic activist base (like this Koch Brothers one) as a way to fundraise online. Amusingly, this is almost the exact mirror image of Young’s ad about D.C. liberals trying to buy the seat. 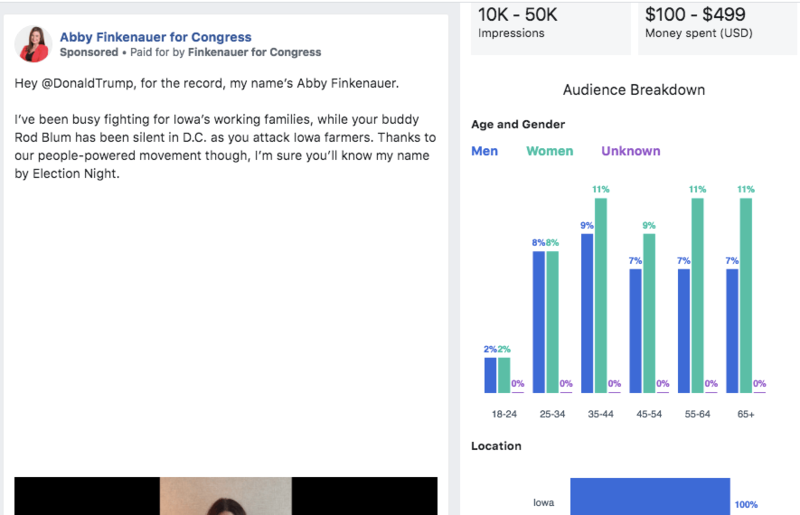 Abby Finkenauer in Iowa’s 1st District takes a very similar approach as Axne: a mix of persuasion TV ads and fundraising appeals for Democratic small donors. Finkenauer must have found a lot of success with this particular video in which she responds to Trump coming to Dubuque and attacking her at an official event with Rod Blum. She’s run dozens of ads on it both in Iowa and around the country. That’s one of the interesting parts of Finkenauer’s online strategy: she’s pitching her candidacy to what I assume would be potential Democratic small-dollar donors nationwide to bring in money to flip this important seat. 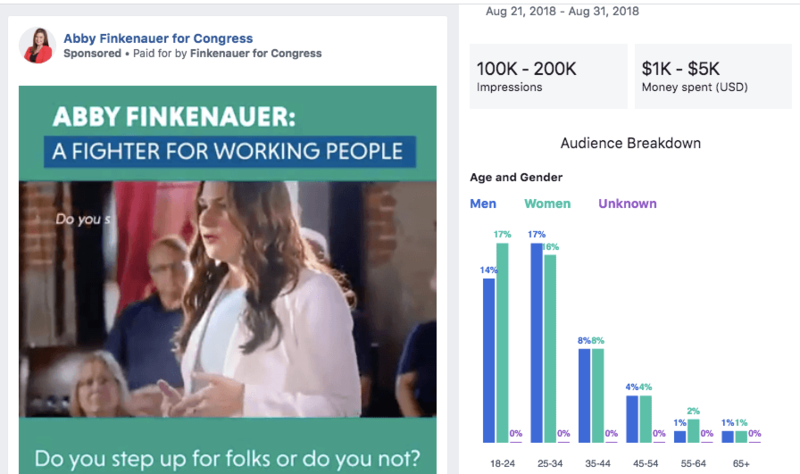 Aside from those efforts, Finkenauer is also running videos of her TV ads, some of which are longer or shorter versions of what’s up on broadcast. She has several different versions of each that is targeted to varying audiences. The big thing missing for Finkenauer and Axne – both DCCC-targeted races – is the lack of messaging to specific parts of the Democratic base that doesn’t always show up in midterms. There are ads targeted to Democrats, but it seems to be the Democrats who are already engaged and would consider donating money. What’s lacking is ads like Reynolds’ and Young’s that look to motivate the broader base. 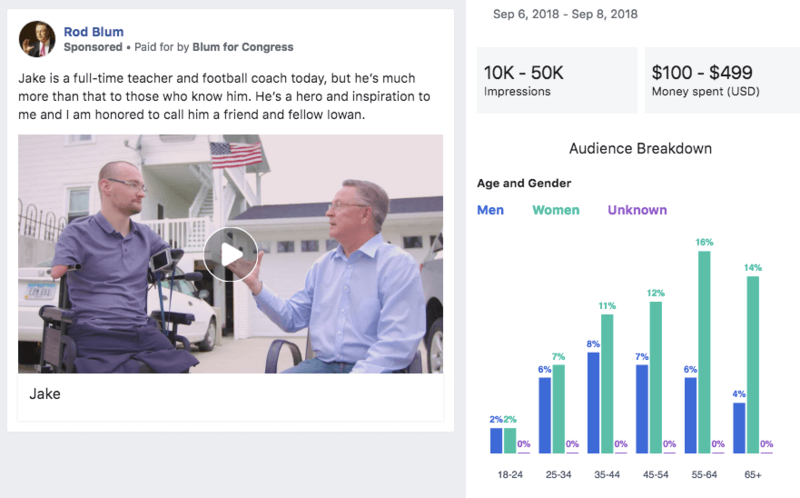 Heritage Action for America, a conservative group, just started running a few mid-sized Facebook ads for Blum, but that’s it. It seems the national party really has pulled out of the 1st District in more ways than one. 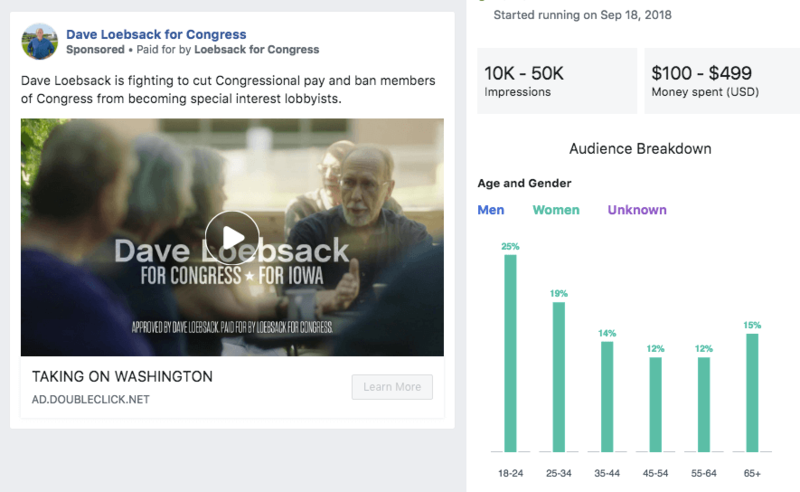 Dave Loebsack began running Facebook ads last week, putting up 15-second ads. Interestingly, all four runs of them are targeted solely at female voters. I didn’t see any for his Republican opponent. In the 4th District, J.D. 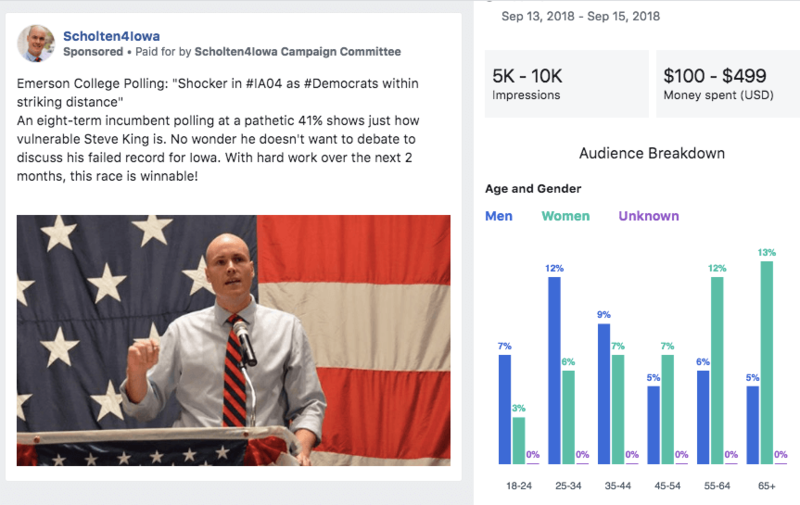 Scholten has a variety of ads aimed at different groups, but there’s not much spending behind most of them. Overall, David Young has by far the most comprehensive digital approach in congressional races, accomplishing separate goals of persuasion, fundraising and rallying the base. Funds are limited for most down-ballot statewide candidates, and most money is typically saved in order to get up on TV in the final few weeks. Still, if you’re strapped for cash, Facebook ads are easily the most cost-effective way to keep your name out there in some manner. The strategies by each statewide candidate is pretty mixed. 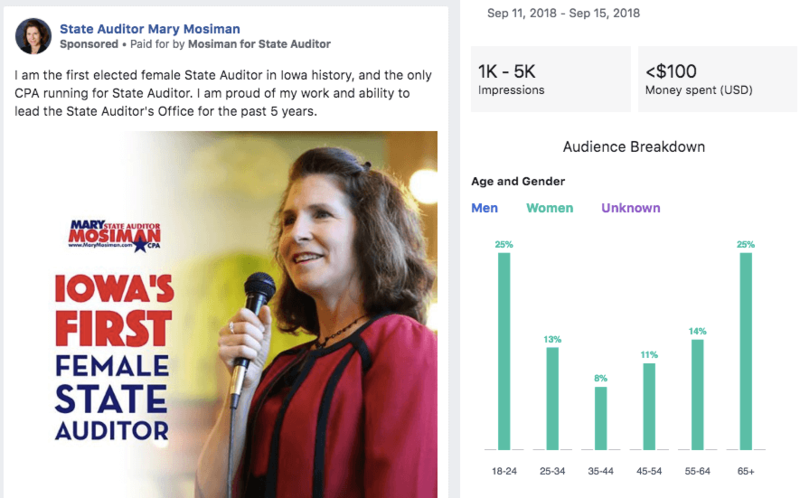 Certain ones are also specifically targeted, like this one aimed at only female voters that highlight how she’s the state’s first female Auditor. 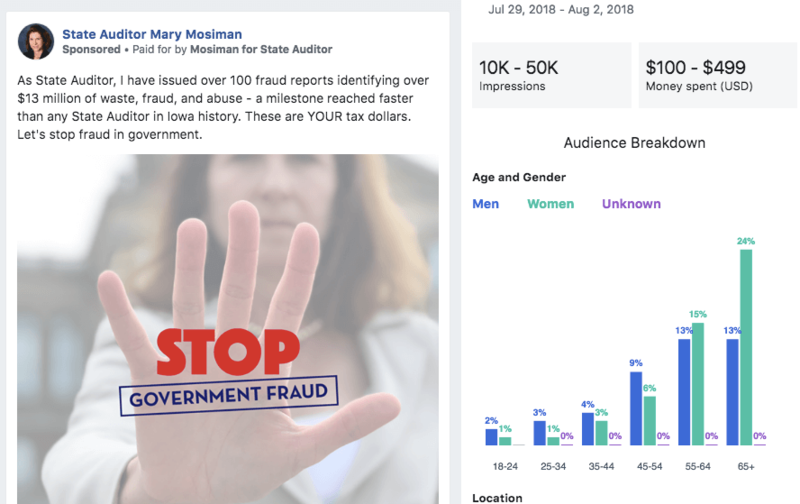 Mosiman also has a series of short videos where she takes questions about the State Auditor’s office and answers them. Those look to be designed to keep her visible online. The problem with all of Mosiman’s ads, however, is that she just isn’t putting much money behind them. She’s got good content created for her, it just isn’t getting in front of many voters yet. On the Democratic side of things, Rob Sand has a whole lot of very small ad buys, targeting certain counties for his upcoming events or spreading news articles written about him. Deidre DeJear has just a couple recent Facebook ads, mostly sharing positive press coverage. Not much is going on in the Secretary of Agriculture race. Republican Mike Naig just put up a few videos with smaller ad buys. Democrat Tim Gannon has just one about his endorsement from Senator David Johnson. This post is dragging on, so we’ll be brief here and return to it at another time. Senate Republicans are the only ones so far who have been running a full, comprehensive set of ads for months. 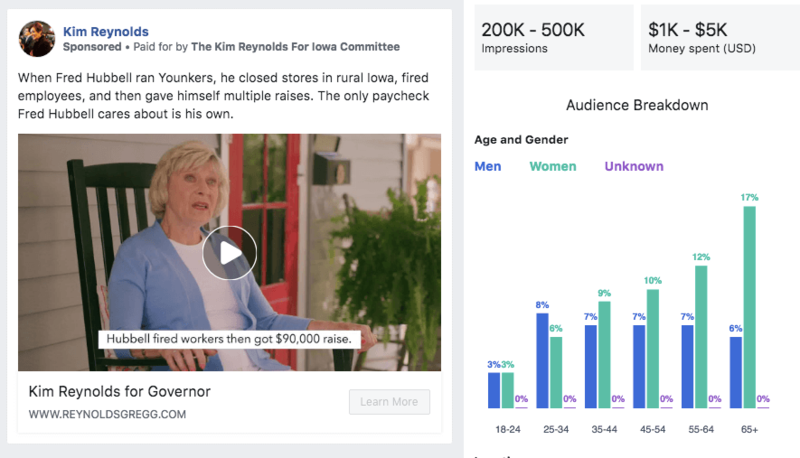 All of their targeted candidates regularly run ads with relatively small to mid-size buys (their districts are small enough that you don’t need to spend much). They seem to have it down to a science. Early on in the campaign, they run simple “Learn More” ads that direct people to like their Facebook page. During the summer, it’s a lot of graphics that are easy to make and look aimed at raising the candidate’s name I.D. Now, they’re running their just-released TV ads on Facebook. I didn’t see any coordinated effort by House Republicans. A couple individual candidates are running some ads, but there’s no major online ad buys yet. Democrats are in a similar situation in the moment, but they appear to have a larger digital ad campaign planned soon. 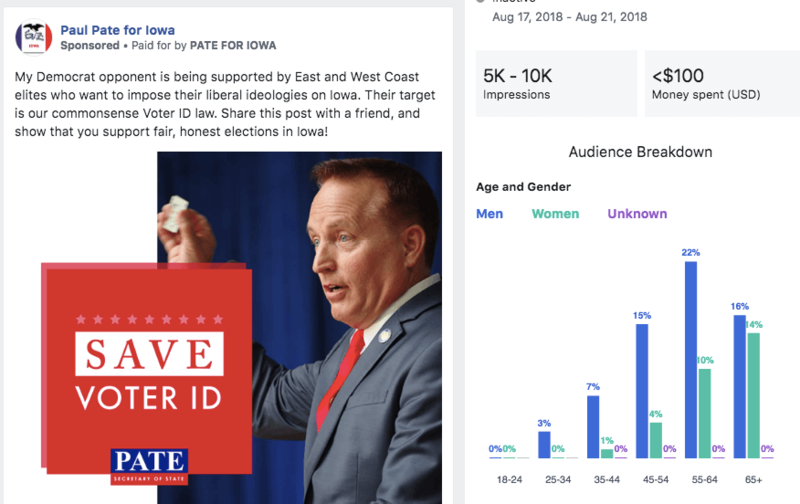 The One Vote At A Time organization came to Iowa to help shoot professional ads for over 20 House and Senate candidates. You can view all of those here (we may have more coverage on this later). 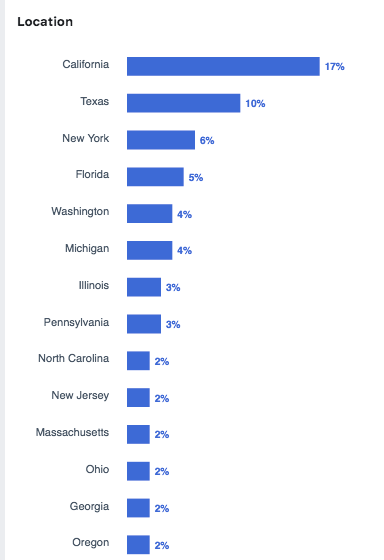 Democrats haven’t begun running those on Facebook in a big way just yet except in a small handful of races like Vicky Brenner’s. Individual candidates like Amber Gustafson have run some of their own ads outside of a coordinated party effort. 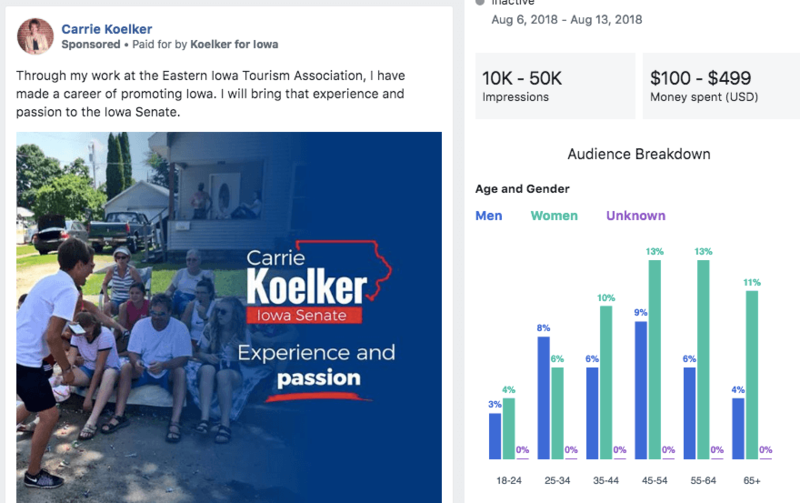 Kayla Koether in the Decorah district appears to run a small set of ads for nearly every Facebook post she makes just to keep her name in front of activists and voters. 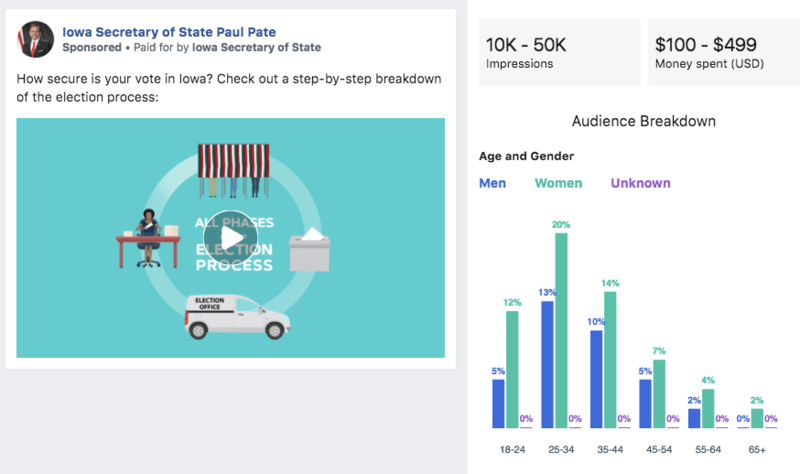 Still, for state legislative campaigns, even just a $100 Facebook ad buy can reach a sizable portion of the district’s voters. It seems like a missed opportunity to not be getting your candidate’s name and face in front of voters early and often like Senate Republicans are. Basically, all of Iowa Democrats’ digital ad strategy feels like just that: a missed opportunity. They’re certainly doing some things right, including soliciting new small-dollar donors. But here’s my biggest worry: Imagine you’re a 24-year-old man or woman living in Marion, a Cedar Rapids suburb. You don’t like Trump and would probably vote Democrat if you actually showed up to the polls. But what campaign messaging are you going to see that might motivate you to turn out? You’re a few years out of college, so you won’t be walking around a campus where students are trying to register you to vote. You only have Netflix, so you’re not seeing any TV ads. You’ve moved around often, so campaigns have outdated addresses for you and don’t send you direct mail pieces. Your cell phone number isn’t on anyone’s record, so you don’t get calls. The apartment complex you live in is locked, so no canvassers knock on your door. How are you going to see anything about Fred Hubbell? The only way is if an ad pops up in your Facebook feed, before a YouTube video or maybe as a radio ad while you’re listening to Spotify. But as we’ve seen here, all of Democrats’ major campaigns are simply repurposing their broadest-possible message from TV onto online sources. If one of the very few issues that Hubbell is messaging on doesn’t resonate with you, why would you care about this election? All of these candidates stand for lots of things that the traditional parts of the Democratic base care about. Hubbell, Finkenauer and Axne talked about many of them in the primary. They could all easily target those messages specifically in to the drop-off voters who care about them. We’ve seen high school students motivated by Parkland; where’s the ads to suburban 18-year-olds about Democrats’ stance on gun violence? Where are videos of candidates talking with folks in the Hispanic community targeted to those specific voters? Or Democrats’ stance on easing marijuana laws to young men? It’s especially frustrating to see because this stuff really isn’t that difficult, costly or time-intensive. And every campaign is filled with staffers in their 20s and 30s who know how social media works. The gubernatorial and congressional campaigns are well-funded and have plenty of staff. Even just quick, 20-second videos of their candidate talking about some specific issue that’s then targeted to that audience online could suffice. Or if Hubbell visited a black church in Waterloo on a Sunday, get a quick video of him talking with a well-known local pastor about the importance of voting and run ads of that in the heavily African-American precincts in Waterloo that don’t turn out well in midterms. It’s not hard. It’s also not an either/or situation. You don’t abandon your persuasion efforts just because you’re focusing some advertising to your base, which again, you can easily do with social media tools. Perhaps we’ll see a lot more activity online in the final six weeks that seeks to motivate the Democratic base. But as I mentioned earlier, every allied Democratic and progressive group should keep their eyes on the Facebook Ad Archive. If you don’t see Democrats running ads aimed at your base within the party, you’d better start running some yourself. Otherwise, it just won’t happen. I really don’t understand this situation. I keep reading about all the youthful energy that is helping Democratic efforts in 2018. Why isn’t that youthful energy and knowledge being tapped to create better online ad campaigns to reach other younger voters? As an older voter who isn’t on social media and still watches local TV news, I have no idea how to do that. But surely many younger Democrats do. The Dems, perhaps the first of the major parties to “embrace” the digital age, have largely stayed in the 80’s – no flair, no innovation. Another thing that makes the Republican, say, Facebook, advertising so insidiously effective, is that it IS targeted – the opposition doesn’t even see it, for the most part, and can’t counter effectively. In addition, I will wager it’s because D-Trip is reading polls and not much else, but they’ve pulled out of Eastern Iowa (esp. Finkenauer’s campaign) entirely. I truly believe that it, in addition to being hidebound and tech-ignorant is pulling another “Wow; Hillary’s so far ahead, we can relax” move. Ultimately, I don’t believe that Reynolds’ FB presence will make a whole lot of difference, but jeez-louise! C’mon, Dems! please join the 21st Century! I wonder if it might help, in the future, to offer Democratic donors a chance to donate money specifically for some of these obvious needs, like social-media campaigns that are well-designed and targeted. Other organizations are moving toward letting donors choose and fund specific projects, partly because more donors in general are demanding that these days.